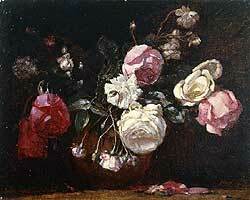 Recognized primarily as a landscape and flower painter, William Thomas Wood was born in Ipswich, Suffolk in 1877. He received his formal art education at the Regent Street Polytechnic and in Italy. 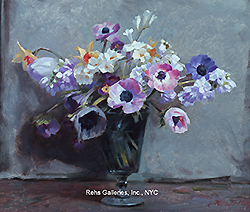 In 1900, at the age of 23, he was living in Putney and exhibited his first work at the Royal Academy entitled Summer Heat. 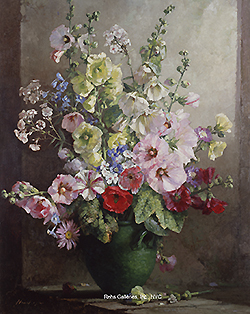 From 1900 – 1947 he exhibited more than 55 works at the Royal Academy including February Flowers (1925), Corfe Castle (1926), Snow Shadows (1930), Cottage Garden Flowers (1933) and Morning Light (1947). In 1918 Wood was appointed the British official war artist for the Balkans. Wood lived most of his life in London, and exhibited frequently. His work was extremely popular during his lifetime and he had a number of one-man shows at the Leicester Galleries as well as receiving nine official public purchases. 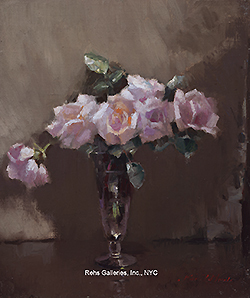 He was elected an Associate to the Royal Watercolor Society (R.W.S.) in 1913, and became a full member in 1918. Largely as a result of his war experience, A.J. Mann hired Wood in 1920 to illustrate The Salonika Front. He served as Vice President of the R.W.S. 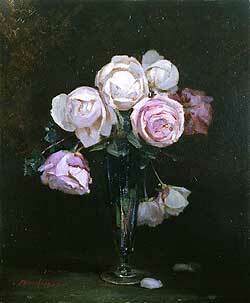 from 1923-1926 and became a member of the Royal Institute of Oil Painters (R.O.I.) in 1927. He died on June 2nd 1958. Works by William T. Wood may be seen in the Victoria and Albert Museum, as well as the museums in Hull, Leeds, Manche­st­er and Perth.